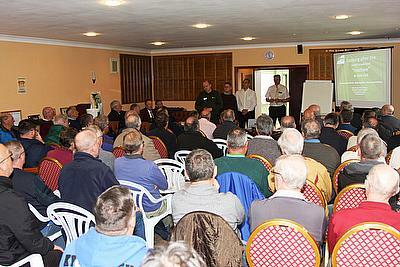 The 2018 Dennis and SISIS Spring / Summer bowling green maintenance seminars finished in style with over 350 people in attendance across the eight venues and an overwhelming number of greenkeepers wanting to attend the educational events. "The seminars are about attendees getting as much information as they can and making the day enjoyable. They can go away with some excellent knowledge which they can then put into practice on their own greens. The 2018 events have been a tremendous success," said Roger Moore, sales and marketing manager for Dennis and SISIS. The informative, educational and interactive seminars combine insightful seminars and practical tips while a number of industry experts also take to the stage to discuss a wide range of key topics. Attendees are able to gain tips on the maintenance of bowling greens, grant funding support, choosing the correct grass seed and the usage of chemicals. A complimentary lunch, which signals the halfway point, offers great networking opportunities before attendees make their way outside to an on-the-green demonstration. The demonstration not only provides a perfect opportunity to see some of the sport's best maintenance equipment in action but also brings together the morning education with the practical elements of applying it to the greens. To find out more about these FREE and highly informative seminars, please contact Roger Moore on 01332 824777 or email roger.moore@dennisuk.com.